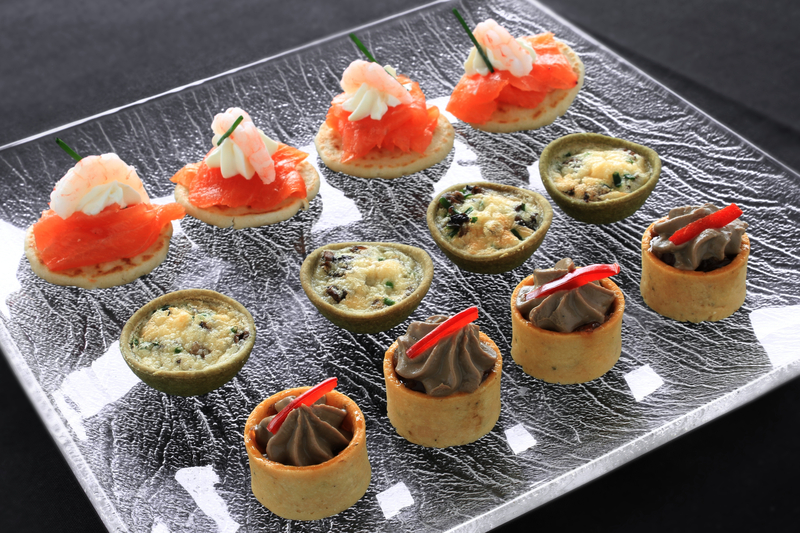 In the years since Club Class Catering started off in Edinburgh we have noticed many changes in the needs and of our customers for canapes. Food standards have risen and people have a much better idea of what they want for an event now, with expectations never higher and rightly so. “We still serve a lot of sandwich food for all sort of events but now our website helps customers to realise the wide range of menus and food style that we make available whether it is canapés for a smart business event or for a special birthday, or increasingly we are being asked to cater for Sushi for both taste and visual presentation, people now want their food to make an impact and really make a special contribution to any event” said our proprietor and chef James Blyth. Even the range of canapés that we now make has grown with some old favourites but many new creations now being available on request. Mature cheddar rarebit bite with Stornoway Black pudding. Filo basket filled with Thai beef and sesame salad. With all of the food being freshly made and locally sourced you can relax and enjoy your event knowing it is catered for with safe hands after more than 20 years of experience of preparing and serving food and expertise with certain types of food especially for the more common dietary needs now more understood and easily prepared for. We can even provide waiting staff to serve food and drinks and will set up a bar on demand. This allows you to relax and be a guest and leave the strain and stress to us, after all that is what we are here for and your special event only comes along once. 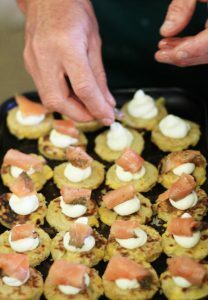 Have a look at our menus and contact us to discuss what we can do to make your event really special. Posted by chef James Blyth on 25th March 2016, updated with our new 2018/19 canape menu.